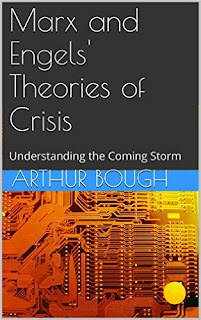 It is a point I made in my own 2014 book, Marx and Engels' Theories of Crisis: Understanding The Coming Storm. But, he is wrong to say that capital is “lacking any alternative model.” (ibid) In fact, later, he goes on to describe what elements of that alternative consists of, even without needing to go beyond the realm of capitalism to postcapitalism. Over the last 20 years, and particularly the last ten, I have set out what that alternative is, and it is an alternative that economic reality itself increasingly imposes. Either capital accepts the logic of its own development, which is manifest in the form of progressive social-democracy, or it will face collapse, and a descent into chaos and anarchy, with sharply falling living standards and authoritarian rule; or less likely, a socialist revolution. As a Marxist, I certainly have no interest in a collapse of capitalism and descent into barbarism. Similarly, whilst I favour a socialist revolution, in the real sense, of a fundamental transformation of the economic and social relations, at the present time, the working-class lacks the class consciousness and will to bring that about, which can only be achieved by a long process of the class making itself prepared to take on the role of ruling class. The process for achieving that actually runs through the transitional phase of a progressive social democracy. The old landed aristocracy long clung to power and influence after its own social function had ended. It was not the landlords that were required for production, once capitalist farmers arose, but only the land owned by the landlords. In reality, the interest of the landlords was furthered by the rational development of capitalist farming, because the increased profits it created made possible increased rents. It did not stop landlords effectively shooting themselves in the foot by attempts to screw higher rents out of capitalist farmers by introducing shorter and shorter leases, and creating a disincentive to fixed capital investment by farmers who also thereby faced having that fixed capital appropriated by the landlord. The landed aristocracy, as it increasingly also sought to sustain its lavish lifestyles, by borrowing against the value of its estates also saw advantage in the nominal value of those estates being as high as possible. A similar situation exists today, with the owners of fictitious capital – of shares and bonds – being in the same position as the landed aristocracy. The paper wealth represented by their inflated asset prices is a delusion. The real long-term interest, even of the owners of fictitious capital, is not a further inflation of those bubbles, especially if it means curtailing real capital accumulation to achieve it. It involves creating the conditions under which real capital accumulation can take place, and which thereby enable a growth in the mass of profit, and thereby the payment of larger amounts of interest, rent and taxes. The alternative model is to extend industrial democracy, so that those who create the profits are able to utilise them to accumulate additional capital, rather than to pay out inflated dividends, and blow up asset price bubbles; to facilitate co-operation between enterprises, so that they can plan their production rationally; to utilise the levers of the state to regulate the economy, so as to facilitate stability for longer-term business planning; and to recognise that, in an already globalised economy, that can only be achieved on at least a continental scale, rather than a national level. It means, for example, in Europe, a single fiscal framework, within an EU state, facilitating transfers to its regions, to promote a more equal level of growth and capital accumulation; the use of EU sovereign bonds, used to raise money-capital for such investment and so on. None of this actually involves replacing the market as opposed to utilising it, regulating it, and ultimately controlling it. In fact, much of this process developed anyway after WWII, because this progressive social-democratic structure represents the logical expression of modern multinational socialised capital. Its rational development was abruptly broken in the 1970's, when, faced with the choice of pushing forward, in the face of a long wave conjunctural shift, the working-class was diverted down the dead-end of industrial struggle, and Little Englander Nationalism, which opened the door for the conservatives, and the events of the last thirty years. The progressive social-democratic alternative is once again being forced back on to the agenda, because neoliberalism (conservative social-democracy) has failed. It has run its course, each milestone being marked by an ever larger financial bubble, and ever larger bursting of those bubbles, with the current bubble due to burst imminently. Once that diversion is out of the way then it's clear that a progressive social-democratic alternative that facilitates rational capital accumulation creates the conditions for company profits to rise, so as to pay higher dividends and other forms of interest, which is of benefit not only to the big money lending capitalists, but to all savers, including those in receipt of pensions, who have been crushed by the huge rise in asset prices over the previous period. The increase in those revenues is far more important than the corresponding collapse of paper wealth, in the form of inflated stock, bond and property markets. In the 19th century, the bourgeois radicals proposed the nationalisation of land, so that all rents would go to the state, thereby defraying the amount the state had to collect in taxes for its upkeep. The same idea was included in the Communist Manifesto in relation to the provision of credit. To achieve something similar today would require an actual social revolution, but even within the confines of capitalism, a progressive social democracy could continue to pay interest/dividends to money-lending capitalists, in the same way that capitalist farmers continued to pay rents to landlords until they became landlords themselves. Marx, in discussing the operation of co-operatives said that the payment of interest was acceptable, and in Capital, he talks about co-operative and joint stock companies being both forms of socialised capital, transitional forms of property that could be extended on a national basis by the use of credit. Even changing company law on corporate governance, so as to remove the right of shareholders to vote, and to introduce industrial democracy would require a large social and political struggle. In Germany, it has long been the case that workers elect 50% of company boards. In the 1970's, at the height of the political power of progressive social-democracy, similar proposals were drawn up in Britain and the EU. In VW plants in the US, auto workers are demanding the same principle be introduced, the main opposition coming from US politicians rather than VW. There is nothing inherently contradictory to the interests of shareholders in the introduction of industrial democracy, where it acts to increase efficiency and profits. It only puts the shareholder in the same position as the bondholder. Borrowers of money-capital would still have to pay a competitive rate for it. The difference is that they would not have to pay more than a competitive rate, and having paid to borrow it, they would exercise control over it, and not as happens now with shareholders, the lender continuing to exercise that control. Paul is right that when the next financial crash comes, and for reasons I've set out elsewhere, the fact that we now see rising economic activity, tight labour markets, rising wages, and rising interest rates means its imminent, there can be no repeat of the 2008/9 bailouts. As global rates rise, central banks are being stretched on a rack. On the one hand, they know they have to try to get from behind the curve. On the other hand they are trying to limit their official interest rate rises, to try to avoid sparking the inevitable sell-off in bond markets that will then also crash stock and property markets. All the time they have to consider the effect on exchange rates, particularly in emerging markets, where falling currencies are prompting large rises in official interest rates. And, now, they also have to factor in the disruptive effect of Brexit, and the moronic antics of Trump. The specific foundations of the current situation, and of the imminent financial crisis were set back in the early 1980's, and have been steadily built up from those foundations, over the last 30 years of neoliberalism. I will examine that development in Part 4.